What are pysanky and how are they made? Listen to an interview of Joan Brander by Stephen Quinn on CBC The Early Edition April 18, 2019. Watch a short video from Shaw TV here. 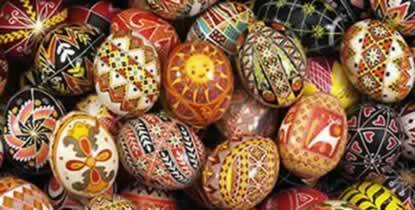 Pysanka expert Joan Brander (who sometimes goes by her Ukrainian name Ivanka) is a Canadian artist, author, instructor and lecturer. 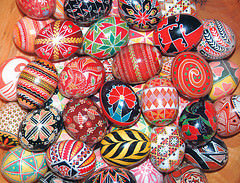 She has been immersed in the cultural activity of using beeswax and dyes to make batik-style decorated eggs known as pysanky (pronounced PIH-sahn-kih) her entire life, having learned the tradition as a child from her grandmother whom she called "Baba". She was born and raised in Saskatchewan and now lives in Vancouver. Her enrichment programs are multi-generational and suitable for Easter, Christmas or any time of year. They include hands-on interactive workshops, demonstrations, displays and lectures for people from all walks of life and age groups. 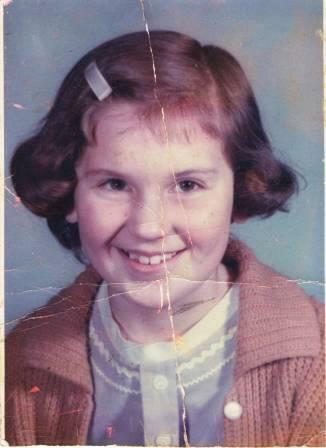 Her published works include a children's activity book, newsletter, bibliography, birthday party planner, instructional guide and countless articles and teaching aids. In 2008 one of her books garnered a place in the bibliography class of the Library of Congress headingsa precedent-setting development. In 2014 she was selected as a finalist for the Arts Education Award from the City of Richmond. Joan keeps herself busy advancing her goals and ensuring a thriving future for pysanky. Her reputation continues to grow and she is highly sought after by program coordinators to share more than 50 years of knowledge. Many traditions have been lost over the years, but Joan is doing her part to make sure that the unique art of pysanky egg decorating endures. Preserving one of the great traditions of all time! 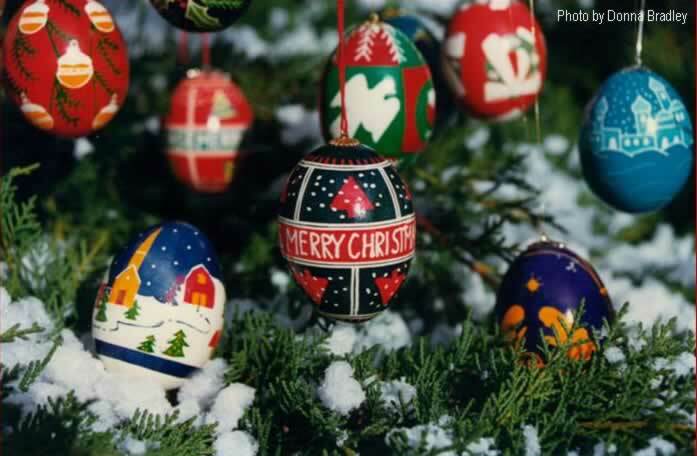 Joan affectionately recalls the time when, as a little girl, she was introduced to the art of Pysanka by her grandmother whom she called "Baba". "I will always remember Baba as being plump and jolly. Her belly jiggled when she laughed. 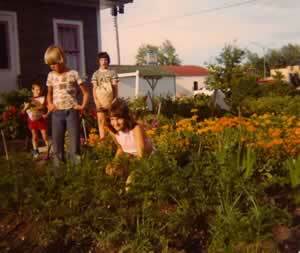 Her garden of beautiful flowers and bountiful vegetables was lovingly tended to and fun to play in. I remember jumping on her bed of feather quilts with my cousins when we visited her. And I remember with fondness the big wood stove where she baked bread, the scent of melting beeswax, the kitchen table where we worked." Joan's first eggs were created without the special dyes and tools she uses today. Back then she made her dyes by soaking sheets of colored crepe paper in boiling water. She made her kistka from metal recycled from a wall calendar. Her first lines of beeswax looked like noodles. She persevered. In her teens she began giving away her Pysanky as "gifts from the heart" to friends people who touched her life, a practice she continues to this day. According to Joan "nothing is more rewarding or pleasurable than to create a lasting gift for a friend." 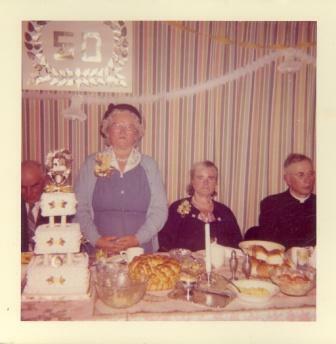 Even with Easter several months away, Joan has everything ready for her annual ritual. It starts right after Christmas. Before her is a lighted candle, a block of beeswax and a kistka. Jars of brilliant dyes stand at one side. In a bowl rest pagan symbols of the life forcefreshly laid eggs, white and smooth. In the same way that the people who originated the pysanka believed in its power, Joan writes symbols on the curved surface of the egg. Her basic design emerges and she bathes the egg in a succession of dyes in the technique akin to batik. Finally she wipes off all the beeswax--and behold! A breathtaking delight. Joan began demonstrating and lecturing in the community where educators and program directors took notice of her teaching skills and friendly manner. It wasn't long before they asked her to conduct workshops for them. Over time Joan amassed a huge collection of her unique works of art and a one of-a-kind library of books. 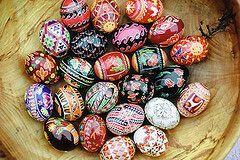 She developed an interest in writing and sharing her knowledge about pysanky. 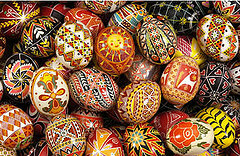 In the busy weeks prior to Easter, thousands of children and adults, families and seniors, will try their hand at pysanky under the skilled direction of Joan as she shares her knowledge and expertise. It means a lot to her when people exclaim how fun and easy she makes it for them. The increasing demand for Joan's knowedge and for affordable and accessible supplies motivated her to do more with her egg decorating hobby. As her early years were spent in her parents' hardware store, starting her own pysanka enterprise was a logical next step. In 1991 she started a business, giving it the whimsical name "Baba's Beeswax". She didn' look far to find the ideal name: Baba because she was her inspiration and teacherBeeswax because of its significance to the technique. Joan is proud to be at the forefront of preserving one of the great traditions of all time. She loves sharing pysanky from workshops and displays to demonstrations and lectures. She enjoys writing books, publishing articles, and connecting through social media. If you think that egg decorating is just for Easter, think again! Select this link to see her books, eBooks, teaching aids, newsletters and video clips.